Presentation of the book of Kateryna Odarchenko. 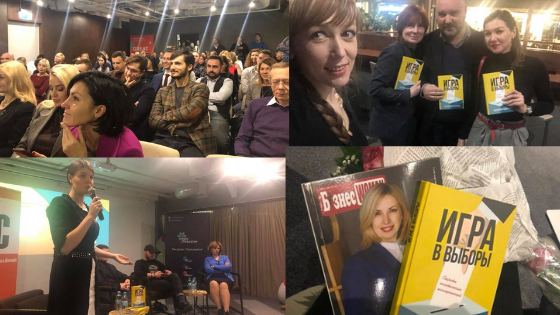 Director of "East West Mentor Ua" Hanna Krisjuk visited the presentation of the book of the famous political technologist Kateryna Odarchenko. Director of "East West Mentor Ua" Hanna Krisjuk visited the presentation of the book of the famous political technologist Kateryna Odarchenko. Many representatives of mass media, PR of political technologists, people's deputies, representatives of the Central Election Commission, public figures and others took part in the presentation. There was no way without conversations and thoughts of visitors about the elections that will take place next year, which actually works and in what forms. The owner of the BusinessWoman magazine and the co-owner of the Ukrainian-Hungarian company "East West Mentor UA" Anna Krisjuk took part in the event. According to Miss Hanna, the presentation took place in one breath and touched everyone who was in the audience, because everyone wanted to share their thoughts: "Kateryna Odarchenko's book itself is really a good visual material for all people who want to build their career in politics and seek how to build your way right. I sincerely congratulate Katya on the successful presentation and gathering of so many experts and specialists in political technologies in one place! " Katerina Odarchenko is a political technologist, partner of SIC Group Ukraine, member of the International Association of Political Advisers (IAPC). President of the Institute for Democracy and Development "PolitA". Specialist in political communications and projects. Has practical experience in the implementation of all-Ukrainian campaigns and political projects, projects of party construction. Organized political communications projects in the European Union and the United States. Develops the theme of lobbyism and GR as the correct methods of communication between business and government in Ukraine.